Artwork of the completed Dolphin. Suggestions: Have a "history" section, including Pikmin 3 info. Take notes from the Hocotate ship on how to further improve this article. The S.S. Dolphin (SS Dolphin in the European version of Pikmin 3) is the delivery ship that belongs to Captain Olimar in the first Pikmin game. It is wrecked when it collides with a comet during a flight to a vacation spot and thirty of its pieces are end up scattered around the five areas of the Pikmin planet; Pikmin involves the collection of these using the Pikmin. When Olimar returns to Hocotate with a fixed ship at the start of Pikmin 2, the S.S. Dolphin is sold to help pay the Hocotate Freight company's enormous debt. It's then replaced by the Hocotate ship. In Pikmin 3, there is no appearance of the S.S. Dolphin. However, there is a reference to the Dolphin in a data file. If the player visits the Quaggled Mireclops arena in the Garden of Hope, they can find a data file that in which Captain Olimar gets upset with the Hocotate ship and wishes to buy back the S.S. Dolphin once the new debt is paid. In Pikmin, if the player presses / while Olimar is on top of the ship's ring of light, his spacesuit's health will be fully replenished, and he will comment on the number of parts he has left to recover. This cannot be done after the sunset warning timer reaches the number 4. While playing through Pikmin, the S.S. Dolphin goes through several stages depending on how many ship parts the player has collected. This is when the S.S. Dolphin has first crashed landed in The Impact Site. Every ship part is missing, smoke and sparks come from the ship, and the hull is very battered. In this stage, the ship's lights are off. This is when the S.S. Dolphin has recovered the Main Engine. The back-side of the hull returns to its original position, the left light returns to normal, and all the lights turn on. In this stage, the ship's lights are red. This is when the S.S. Dolphin has recovered at least 5 ship parts. 3 gears appear near the bow of the ship, and a piece of the hull returns around the cockpit. In this stage, the ship's lights are yellow. This increases the Dolphin's capabilities to be able to reach The Forest Navel. This is when the S.S. Dolphin has recovered at least 12 ship parts. A weird whisk-like antenna extends from the top-left side of the Dolphin, and the piece of the hull covering the cargo hatch is unbent. In this stage, the ship's lights are green. This increases the Dolphin's capabilities to be able to reach The Distant Spring. This is when the S.S. Dolphin has recovered at least 29 ship parts. The final pieces of the hull appear between the Anti-Dioxin Filter and both Ionium Jets, and a buckle covers both sides of the ship. In this stage, the ship's lights are blue. This increases the Dolphin's capabilities to be able to reach The Final Trial. This is when the S.S. Dolphin has recovered every ship part. The Dolphin is in its fully functional stage, the whisk-like antenna retracts, and every ship part is properly aligned and fitted. In this stage, the ship's lights are purple. 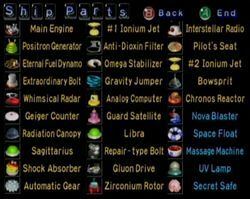 The 30 ship parts in the game. The ship has a total of thirty known parts. Their retrieval is necessary in order to complete the game, and they can be found in all areas. Five of the parts are optional. The S.S. Dolphin's name is a reference to the GameCube's development codename, the Dolphin. It could also be a reference to a yacht named SS Delphine. The Dolphin blasting off early in the game. The S.S. Dolphin flying through space in the intro. The S.S. Dolphin collides with the comet. The completed Dolphin. The Secret Safe, however, is still unaccounted for. The Dolphin after it crashes in The Impact Site. Captain Olimar in the S.S. Dolphin in the opening of Pikmin 2. The ship being salvaged for Pokos. The S.S. Dolphin as seen in Animal Crossing: New Leaf. The S.S. Dolphin in Animal Crossing: City Folk. The S.S. Dolphin makes a cameo in Animal Crossing: City Folk as a piece of furniture distributed by Nintendo from July 20th to August 3rd to celebrate the Apollo moon landing. It also makes an appearance in Animal Crossing: New Leaf, as a fortune cookie prize. When viewed from above, the nose of the ship looks like a Poké Ball. 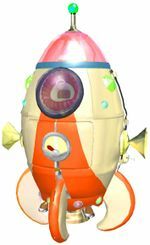 The S.S. Dolphin may have a personality of its own, as Olimar's notes on the Analog Computer state that the Dolphin is quick to anger. This page was last edited on March 16, 2019, at 21:17.